Holy crap! These guys have an iPhone app--just sayin'. 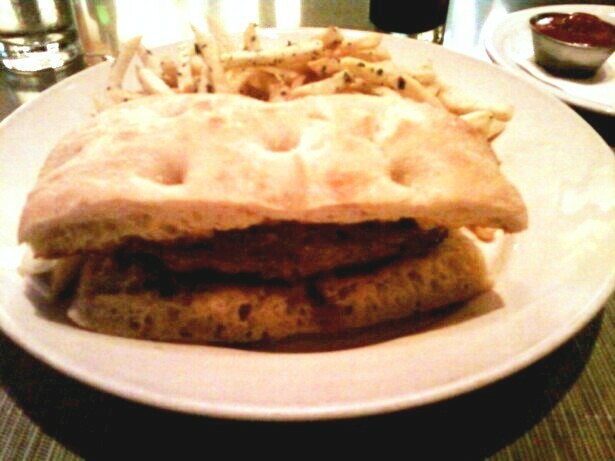 I was, recently, pointed to The Nook by a co-worker, who claimed that they made a fine cheeseburger. The Nook was really tucked away in............a nook. Happy Meal and I overshot it twice and had to call for them to direct us to the spot. That's a LOT of bun. The Beef: 80:20 coarse, pre-ground, Sterling Silver, chuck. I had to ask what Sterling Silver meant in terms of beef, and I have provided a link for those as clueless on the topic as I was. In spite of the fat content, the burger was not overly greasy, and I attributed that to the coarse grind, which allowed more of the fat to render out during the cooking (overcooking) process. It tasted strongly of dry-aging, which provided a pleasant front note. Also, since the beef was pre-ground and shipped in plastic tubes from somewhere far, far away, it presented a slightly rubbery mouth feel. The fact that the beef was overcooked did not help. The Seasoning: The hit the outside with a salty, seasoning blend. The interior was relatively bland, but the strong beef flavors carried the dish over this small hurdle. 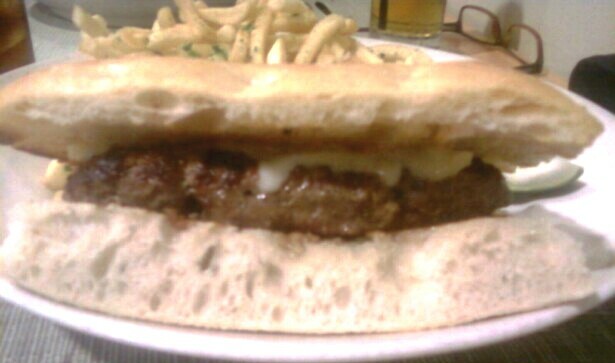 The Cheese: They topped the burger with a mild and nutty Gruyere. Fortunately, the weak cheese was compensated for by the seasoning and the beefiness of the burger meat. The Gruyere was, effectively, a "throw away" ingredient, since is contributed nothing buy a little texture and nothing in terms of flavor to the dish. This burger would have benefited from the mighty, Hook's Cheddar that was used at The Belvedere. The Preparation: My cheeseburger came out an aggressively overcooked to Well in spite of the fact that I ordered it Medium--sigh. It wasn't the end of the world, since quality beef can tolerated some overcooking and remain flavorful and juicy. The Nook kept up their end of the bargain, and they used quality beef. The overcooking also melted more of the collagen in the chuck, which created a richer beef flavor. It was an OK trade off, but I would have preferred that the burger just be cooked the way that I requested. But I ordered this Medium...not Well Done. The Bun: A neutral but firm Pane Rustico (Rectangular Rustic Sandwich Roll) from La Brea Bakery served as the bun for the oval burgers--this put me in fear of a Father's Office burger, but instead of being a, courtesy of Sang Yoon, PIG AWFUL DISASTER, this was a pretty good cheeseburger. 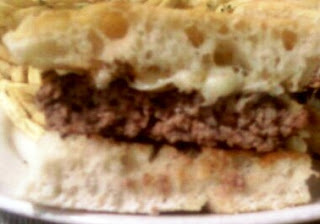 The roll's sourdough-like firmness served to perfectly balance the chewiness of the pre-ground, and overcooked, burger patty. Additionally, the bottom of the roll was lightly dusted with white, corn meal, and this created an even more interesting texture profile. The roll was buttered and heavily toasted, which was remarkable to chew on once the blood and juices of the burger soaked in (there was actual blood on the first visit...when they didn't vulcanize the patty). That could have been a dish in of itself. The Fries: They were good on the second visit. That time they were delicately crispy and properly seasoned--previously, they were unpleasant. The Value: Generally worth the $12 price tag--more so if they get on the ball with the preparation of the food. Burger Review : That was close, and with a few tweaks, it could become a really good burger. However, two visits within 3 days and each had different issues. The Nook is unlikely to get to excellent at this rate. It was a real struggle not to rate this burger lower, because of the quality of the incompetent preparation and the consistency issues, but the ingredients were first class. 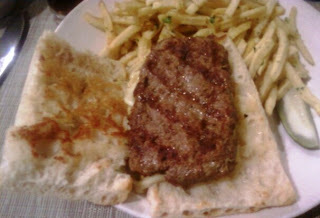 Note: On a previous visit, the burgers were also overcooked--the grill was much hotter, so the sear was better--the fries were under-seasoned and lank. Clearly, there was a consistency issue at The Nook. The ingredients were good, but a guiding hand in the kitchen would have been of great value. Dude! You need the check the Nook in Minnesota. aka Casper & Runyon's Nook.